I swear I did not put that squash and those tomatoes in this baby carriage. This person's just got it all figured out. I suppose you could have both a baby and a farmers' market to go to, but then you'd need a second cart. Know what all this squash means? Farmers' markets will soon be shutting down for winter. Not Jean-Talon, Atwater, Maisonneuve and Lachine (they go year-round), but the Plateau Market, the Mile End Market, Verdun Market, and Frontenac Market all end in two weeks (the 17th of October for the Plateau; the 14th for Mile End; and the 16th for Frontenac and Verdun, as well as St-Henri, and Little Burgundy). The Outremont market is already closed. So you need to take advantage of farm-fresh, local produce while you can. For some that means canning what produce is left, and for others that simply means a lot of tomato soup, corn if you can still find it, and stuffed or roasted peppers. Either way, I say you should bring a cart or carriage and save yourself a week of back pain. Then there's Thanksgiving coming up. Try getting a few pounds of potatoes, some squash or sweet potatoes, carrots, and a pound of apples home all by your lonesome. At least the market is still open for Thanksgiving. Here in Quebec we're lucky that we could actually do an entirely local (100-mile?) Thanksgiving, including the turkey. That's a fun challenge for your turkey weekend. 1. 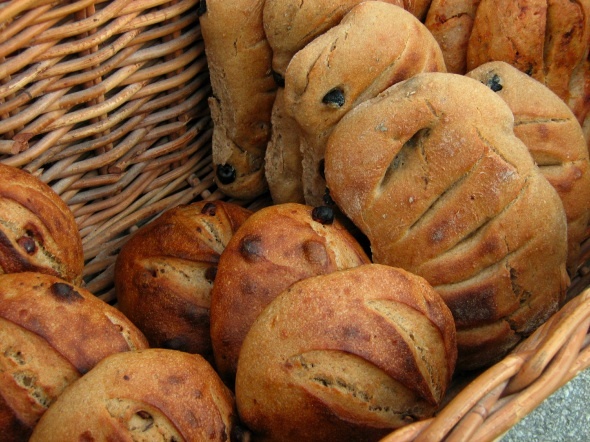 The sourdough bread at LaPerle et Son Boulanger, Plateau market, Sundays 10am-3pm until October 17th. In two weeks I'm going to have to start making my own sourdough bread because this is the best stuff in the world and I don't know where to get it outside of the bakeshop in Dunham. Montreal has other great bread, but this is heavenly - tangy and fresh - and the toasted hazelnut version makes my Sunday. Here's a video from the MarchÃ© Fermier website about LaPerle et Son Boulanger and their market breads. 2. Chili peppers from Les Jardins du Matin, Mile End Market, Thursdays until Oct. 14th, 4:30-8:30pm. Every time I bought a pound of long red chili peppers I got a funny look, and then a smile. 3. The sense of community that the markets create - the producers, the consumers, sometimes the music - all outside under tents. It's actually to the point where I see tents and automatically think farmers' market. I'll also miss Ste-Anne-de-Bellevue because of the amazing feeling of standing on the edge of the water on a sunny summer day. I'll miss the McGill market because it feels like it just started growing. Each week feels bigger, with different vendors and more students experiencing a market for the first time. Mostly I'll miss the producers I met over the course of the summer - my farmer John and his tomatoes (that got better later in the summer. Good thing I stuck it out), and StÃ©phane from Jardin Biologique Kale et cie who doesn't even know my name. I won't miss the beautiful teas from Ochado that I smelled every week and finally bought this week (both practical and in good etiquette since I'd had so many samples) because you can order them online. 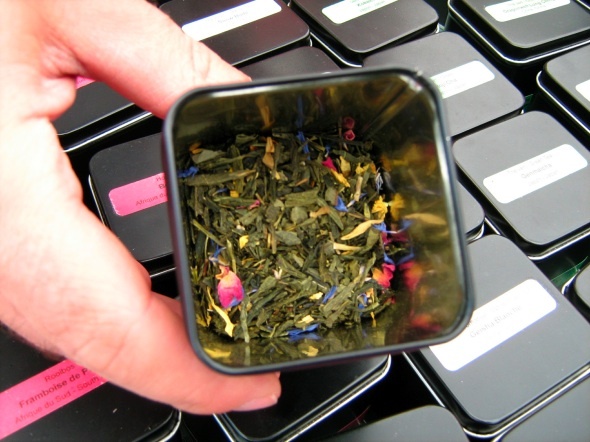 Also, the colder it gets, the more you need tea, but the less you want to make the trip to the farmers' market to get it. It's kind of counter-productive to make yourself cold in search of something to warm you up. So if you really feel like you need a use for that cart, maybe October 18th is a good day to start thinking about having a baby. You know, once the markets are closed. Great article. 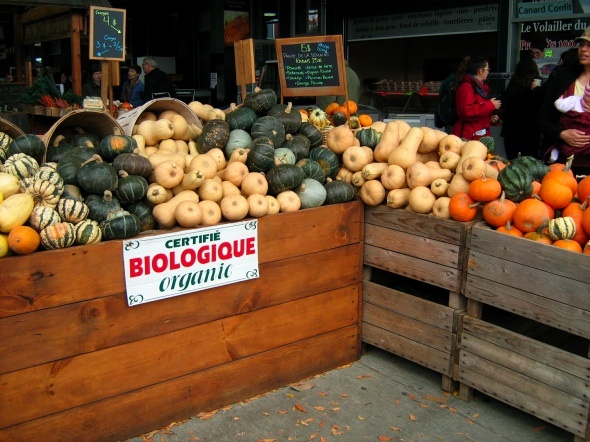 Where did you take the picture of the "biologique" squash? Is that Jean-Talon market? Yes, Louise, it's from Jean-Talon. It's my favourite stand on the south east corner of the market, just outside the doors near Qui Lair Cru and right across from where I buy my bison on the corner. They sell baskets of leftover (slightly less pretty) squash, onions, garlic and sometimes apples or tomatoes for $5. Their "first-rate" baskets are $8 and are still a steal. I'm not sure if they stay open all year or not, but they are open late into the season. 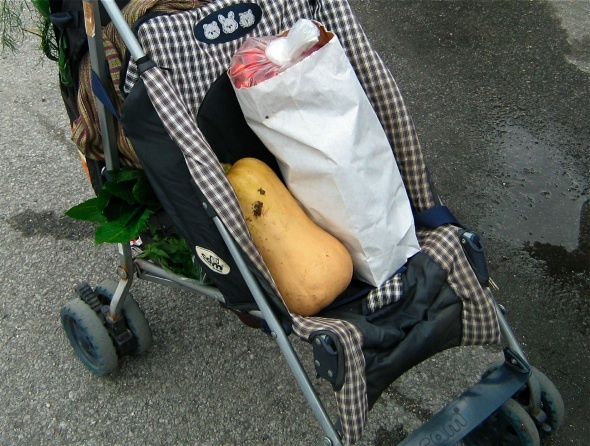 The squash in a baby carriage is from the Marche Fermier that used to be at Marianne and Laval but now only happens at Parc Lahaie. It's finished for the season. Hello Mr. Market,Take care! I have posted cotemnms last year during the great panic. We have got through. Yr portfolio passed 5M. Mine also passed through 9M recently with holding mainly in China Stocks e.g. 2628,1088,3328,1919 etc. Value investing is great but need patience and patience need health too. Take care. Continue to hold stock now!!! We are laughing to the end. Recently, i am thinking the problem of when to sell. Of course, i don't mean to sell now. This is a philosophical and psychological question. What do you think?MC. An impressive share, I just with all this onto a colleague who was performing a little analysis with this. And he the fact is purchased me breakfast due towards the fact I uncovered it for him.. smile. So ok, ill reword that: Thnx for that treat! But yeah Thnkx for spending any time to go more than this, I believe strongly concerning this and love reading more about this topic. If it is possible, as you grow expertise, does one mind updating your weblog post having a lot more details? It can be highly of great help for me. Large thumb up because of this post! Most likely they'll not respond or they're going to respond praoclaiming that they received your letter. when they have been a whole new family as an example, and from any disability pensions or allowances. They want cash from you finding out, as quick as is possible , together with the least number of effort on their own part. Providing Quality Products, Excellent Service, Competitive Prices and Prompt Delivery. Our products are selling well both in domestic and foreign markets. Our company is trying to be one important suppliers in China. We've got more than 10 years experience of production and export business. We always develop and design kinds of novel items to meet the market demand and help the guests continuously by updating our goods. We've been specialized manufacturer and exporter in China. Wherever you are, make sure you join us, and together we will shape a bright future in your business field! What is good price? We provide customers with factory price. In the premise of good quality, efficiency will have to be paid attention to and maintain appropriate low and healthy profits. What is a fast delivery? We make the delivery according to customers' requirements. Although delivery time depends on the order quantity and the complexity of it, we still try to supply products and solutions in time. Sincerely hope we could have long term business relationship. With well educated, innovative and energetic staff, we are responsible for all elements of research, design, manufacture, sale and distribution. By studying and developing new techniques, we are not only following but also leading fashion industry. We listen attentively to the feedback from our customers and provide instant replies. You will instantly feel our professional and attentive service. Our products have mainly exported to south-east Asia Euro-America, and sales to all of our country. And depending on excellent quality, reasonable price, best service, we've got got good feedback from customers overseas. You are welcomed to join us for more possibilities and benefits. We welcome customers, business associations and friends from all parts of the world to contact us and seek cooperation for mutual benefits. We are looking forward to cooperating closely with you to our mutual benefits and top development. We guaranteed quality, if customers were not satisfied with the products' quality, you can return within 7days with their original states. The company attaches great importance to product quality and service quality, based on the business philosophy "good with people, genuine to whole world, your satisfaction is our pursuit". we design products, According to customer's sample and requirements, to meet the needs of the market and offer different customers with personalized service. Our company warmly welcomes friends at home and abroad to visit, to discuss cooperation and seek common development! Trust us and you will gain more. Please feel free to contact us for more information, we assure you of our best attention at all times. Our final target is "To consider the most effective, To be the Best". Please experience cost-free to call with us if you have any prerequisites. Sincerely hope we are growing up together with our prospects all over the environment. We guaranteed high quality, if clients were not satisfied with the products' quality, you can return inside 7days with their original states. Should you be interested in almost any goods, remember to truly feel totally free to get in touch with us for further facts or be sure to deliver us email right, we will reply you in just 24 hrs as well as the finest quotation are going to be provided. We have experienced manufacturing facilities with more than 100 employees. So we can guarantee short lead time and quality assurance. Our Lab now is "National Lab of diesel engine turbo technology " , and we own a professional R&D team and complete testing facility. Should further information be required, please contact us at any time! The president and all the company members would like to provide qualified goods and services for customers and sincerely welcome and cooperate with all native and foreign customers for a bright future. We warmly welcome all intrigued prospects to make contact with us for more details. We will empower people by communicating and listening, Setting an example to others and learning from experience. Make sure you come to feel absolutely cost-free to speak to us for organization. nd we think we're going to share the ideal trading practical experience with all our retailers. We warmly welcome domestic and overseas customers send inquiry to us ,we have 24hours working team! Anytime anywhere we are still here to be your partner. Our organization. Situated inside the national civilized cities, the visitors is very easy, unique geographical and economic situations. We pursue a "people-oriented, meticulous manufacturing, brainstorm, construct brilliant" organization. hilosophy. Strict top quality management, fantastic service, reasonable cost in Myanmar is our stand on the premise of competition. If vital, welcome to make contact with us by our web page or telephone consultation, we are going to be pleased to serve you. With the spirit of "credit first, development through innovation, sincere cooperation and joint growth", our company is striving to create a brilliant future with you, so as to become a most valuable platform for exporting our products in China! In order to carry out our goal of "customer first and mutual benefit" in the cooperation, we establish a professional engineering team and a sales team to supply the best service to satisfy our customers' requirements. Welcome you to cooperate with us and join us. We are your best choice. Products have been exported to Asia, Mid-east,European and Germany market. Our company has constantly been able to update the products performance and safety to meet the markets and strive to be top A on stable quality and sincere service. If you have the honor to do business with our company. we will definitely do our very best to support your business in China. We believe in quality over quantity. Before export of the hair there is strict quality control check during treatment as per international quality standards. Being the top solutions of our factory, our solutions series have been tested and won us experienced authority certifications. For additional parameters and item list details, be sure to click the button to acquire additional nformation. We aim to build a famous brand which can influence a certain group of people and light up the whole world. We want our staff to realize self-reliance, then achieve financial freedom, lastly obtain time and spiritual freedom. We do not focus on how much fortune we can make, instead we aim to obtain high reputation and be recognized for our products. As a result, our happiness comes from our clients satisfaction rather than how much money we earn. Ours team will do best for you always. We have to continue to uphold the "quality, comprehensive, efficient" business philosophy of "honest, responsible, innovative"spirit of service, abide by the contract and abide by reputation, first-class products and improve service welcome overseas customers patrons. As a way to use the resource on the expanding info in international trade, we welcome prospects from everywhere on the web and offline. In spite on the high quality items we offer, effective and satisfying consultation service is supplied by our qualified after-sale service group. Item lists and detailed parameters and any other info weil be sent to you timely for the inquiries. So please make contact with us by sending us emails or call us when you've got any questions about our organization. ou could also get our address information from our site and come to our enterprise. We get a field survey of our merchandise. We are confident that we'll share mutual accomplishment and create solid co-operation relations with our companions within this market place. We're seeking forward for your inquiries. We sincerely welcome friends from all over the world to cooperate with us on the basis of long-term mutual benefits. With high quality, reasonable price, on-time delivery and customized & personalized services to help customers achieve their goals successfully, our company has got praise in both domestic and foreign markets. Buyers are welcome to contact us. Are you still looking for a quality product that is in accordance with your good company image while expanding your product range? Try our quality products. Your choice will prove to be intelligent! Our company has always insisted on the business principle of "Quality, Honest, and Customer First" by which we have won the trust of clients both from at home and abroad. If you are interested in our products, please do not hesitate to contact us for further information. Customers' reward and fulfillment are usually our biggest objective. Please make contact with us. Give us a probability, provide you with a surprise. Now we have a dedicated and aggressive sales team, and many branches, catering to our main customers. We have been looking for long-term business partnerships, and ensure our suppliers that they will undoubtedly benefit in both short and long run.